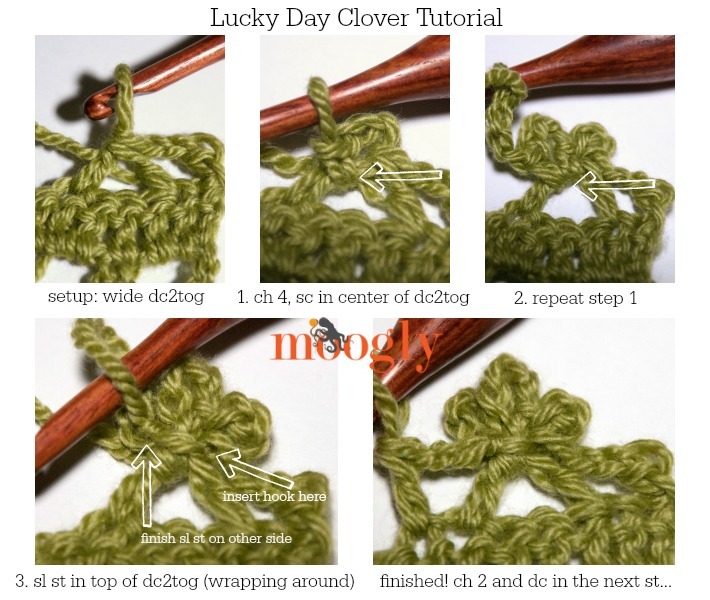 We could all use a little extra luck once in a while – and the fun little clovers or shamrocks in the Lucky Day Cowl might just be the token you need! At the very least, it’ll decrease the odds of pinching! And I have to point out that this is just about the softest, cosiest, most pet-able thing I’ve ever crocheted! It’s SO soft! Cashmere is amazing, and if you get to crochet with it, then you are indeed very lucky. 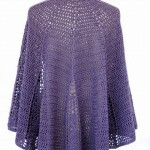 It also stretches out quite a bit on blocking, displaying the stitch pattern beautifully. So if you use a different yarn, you’ll want to pay attention to the finished size vs the Row count… but if you do get a chance to use LB Collection Cashmere, you won’t regret it! wide dc2tog – (dc2tog skipping 3 sts in the center) – yo, insert hook in next st, pull up a loop, yo, pull through 2 loops (2 loops remain on hook), skip the next 3 sts, yo, insert hook in next st, pull up a loop, yo, pull through 2 loops (3 loops on hook), yo and pull through all 3 loops. tr – (triple or treble crochet) – yo twice, insert hook into indicated st, pull up a loop, (yo and pull through 2 loops) 3 times. Row 3: Ch 6 (counts as tr and ch 2), *sc in the middle ch-4 loop of the next clover, ch 2, tr in the next dc st, ch 2; repeat from * to end, finishing last repeat with a tr in the 3rd ch of the beginning ch-5; turn. Row 5 – 55: Repeat Rows 2 – 4. Continue with Color A for 1st round of edging. Round 1: Ch 1, sc evenly around entire cowl (increase 1 st in corners), join and finish off. Round 2: With Color B, join to 1st st of previous round, ch 1, sc in each st around (increase 1 st in corners), join with sl st.
Finishing: Block cowl and then sew on buttons opposite the ch-1 button holes. Have a lucky day! 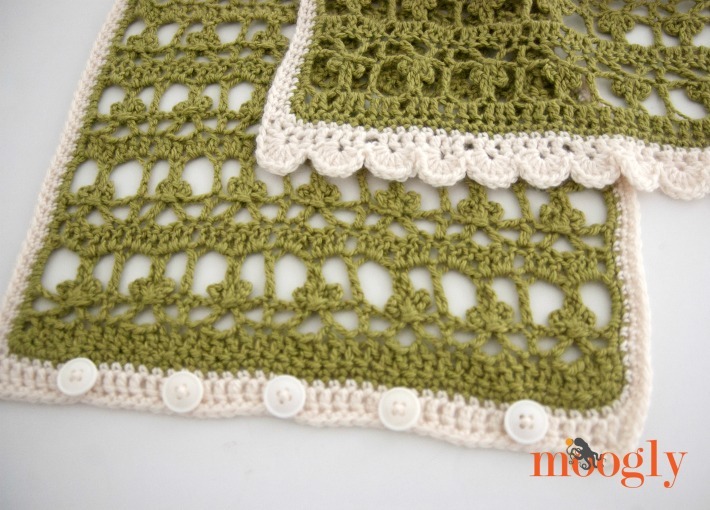 I hope you’ve enjoyed this crochet pattern! 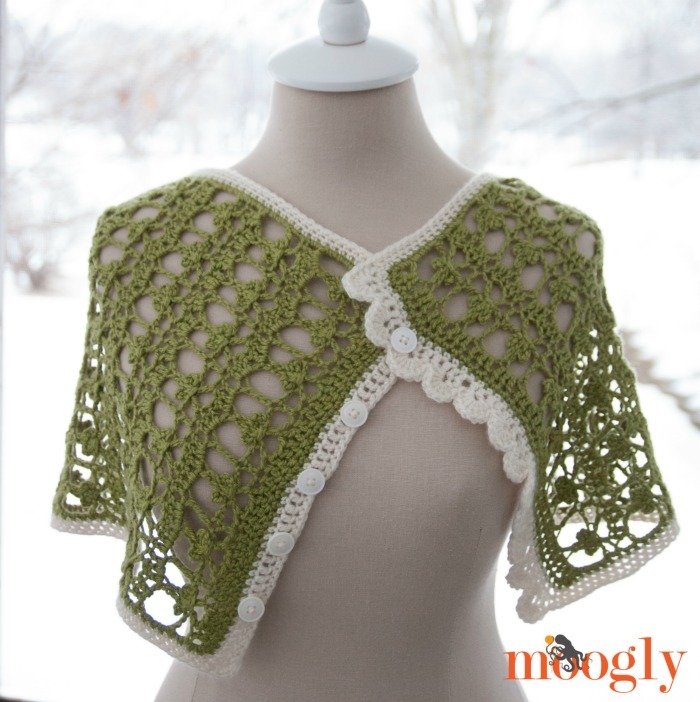 It was a lot of fun coming up with a shamrock or clover stitch that was clear but not too in your face – making the Lucky Day Cowl wearable any day! It is beautiful. I have worked with LB cashmere, I made a simple cowl for my husband and it was wonder to work with, soooo soft. I think I will make this and donate it to a Church fundraiser. Thank you for sharing. So pretty! Wonderful design, Tamara. 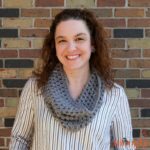 I never worked with that yarn, but you make me want to try it… I always add buttons to infinity scarves/cowls for versatility. This is so pretty and fun! I am going to have to make this soon. Thanks so much Tamara! This is so gorgeous! I love the lacey openwork & the border which gives it that vintage touch. I have to make this for St. Patrick’s Day/Spring! Absolutely gorgeous. Tamara!! I just love all that you create,design, and share with us !! Any of us are Blessed to be here and I share you link all the time; for beginner friends and old timers too!! 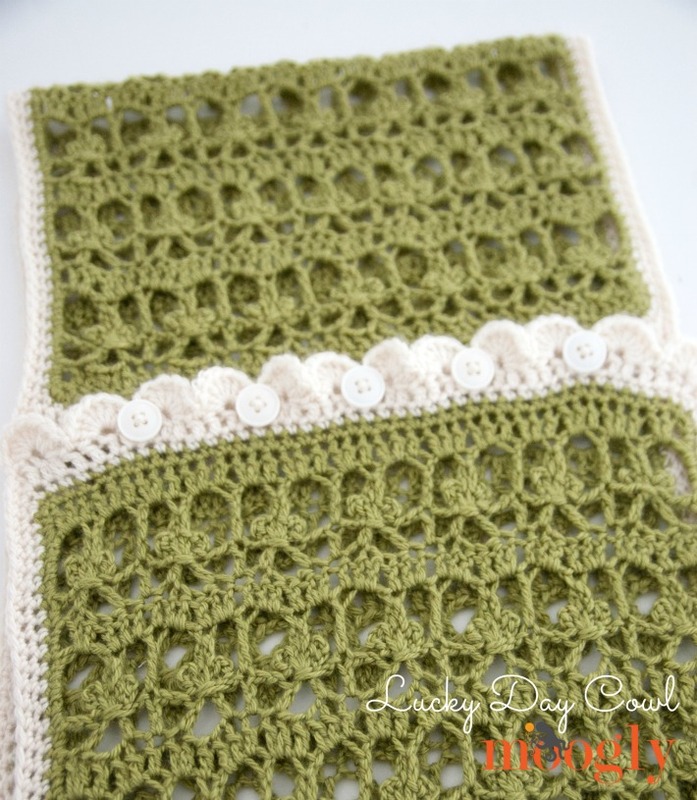 I love this Lucky Cowl pattern..I am having trouble keeping count of the 3rd row (the row of double crochet). I know it needs to be 43 but I end up either to short or to many. Any tips? Thank you Dawn! It’s always hard to figure out where things are going awry without being there, but counting is definitely step 1 – and it sounds like you’ve got that part down! Each row of course builds on the previous ones, so make sure you have 7 “clovers” and then a tr between each clover, with the st in the top in the row after that. Beyond that, just making sure you get a dc in each end, in each tr and sc, and 2 dcs in each ch sp is all I can recommend!